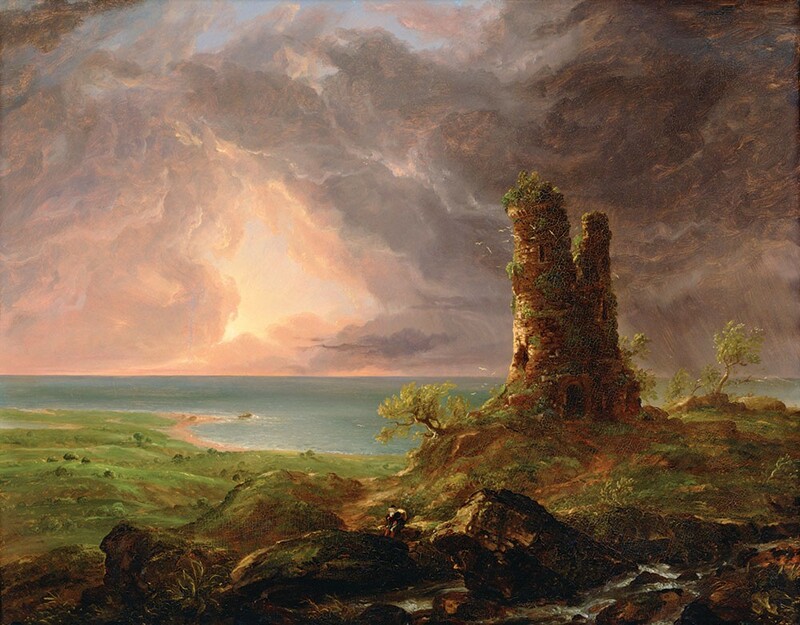 Thomas Cole's Ruined Tower, an oil painting on composition board from 1832-6, is featured in the exhibit “Picturesque and Sublime: Thomas Cole’s Trans-Atlantic Inheritance,” at the Thomas Cole National Historic Site in Catskill through November 4. "Thomas Cole invented the American sublime," remarks Tim Barringer, an art history professor at Yale, speaking of the founder of the Hudson River School of art. Barringer is also co-curator of "Picturesque and Sublime: Thomas Cole's Trans-Atlantic Inheritance," which opens on May 1 at the Thomas Cole National Historic Site in Catskill. This exhibition speculates about the artistic influences on Cole by age 17, when he came to Steubenville, Ohio, from England, in 1818. Before mandatory public education, a 17-year-old had a considerable body of experience. In his work as an engraver's apprentice, Cole must have seen hundreds of artworks in reproduction. Which examples of European landscape painting most affected him? Cole left no written records of his studies, so the five curators had to proceed by deduction and intuition through the holdings of the Yale Center for British Art. "We had this really fun time pulling out boxes of Turner, Constable, James Ward, P-J de Loutherbourg, John Martin—all these amazing artists—and we covered three big tables with prints, just loads and loads of prints," Barringer recalls. "Then we went through them with Thomas Cole's mind, and picked them out." The picturesque and the sublime were the two major styles of landscape painting at the turn of the 19th century. 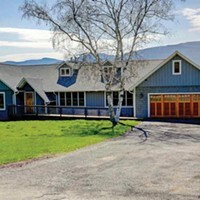 The picturesque was connected to tourism, which then was largely restricted to the leisure class. "Sublime" paintings conveyed the thrill of terrain with an edge of danger, such as J. M. W. Turner's magnificent, spooky Alpine watercolor, Devil's Bridge, Saint Gothard's Pass (c. 1804). "Constable's Hadleigh Castle made probably more of an impression on Cole than any other painting," observes Barringer. A mezzotint etching of the image by David Lucas—a stark, ruined castle under a roiling sky—appears in "Picturesque and Sublime." A related show curated by the same team, "Thomas Cole's Journey: Atlantic Crossings," is on view at the Metropolitan Museum of Art in New York City through May 13, and will travel to the National Gallery in London. "It's kind of amazing that it was exactly 200 years ago that Cole first came to America, and this June his paintings will go sailing back to London for the show over there," marvels Elizabeth Jacks, executive director of the Thomas Cole National Historic Site. But not all his paintings. Four major works by Cole appear at his former dwelling. "He's a self-taught artist, but what is remarkable is the sophistication that he achieves at such an early age," assesses Barringer. The Clove, Catskills (1827), painted when Cole was 26, boldly portrays flaming orange leaves never seen in Western art—because European maple trees don't turn those colors in autumn. Before the advent of cinema, paintings were the source of visual drama. 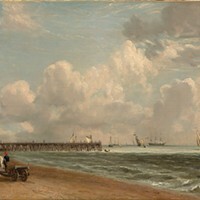 Nineteenth-century landscapes illustrate the relationship between land and sky, a metaphor for the connection between Heaven and Earth. "Thomas Cole felt that America was this new Eden, like the Garden of Eden, created by the Divine Force and still unspoiled," says Jacks. Cole had a penchant for grand theories, so his Catskill Mountain House: The Four Elements (1843-4), showing fire, rain, wind, and earth, was executed with particular devotion. The landscape twists and turns on itself like a corkscrew, beginning with a curious rock formation in the foreground. Above, in the sky, is an invasion of alien spaceships—or maybe just a thick, plume-like black cloud. Further back, high lightning flashes. In the near distance, a forest fire rages. The vista is apocalyptic, yet wonder-struck. "This painting has not been exhibited in my lifetime," Barringer explains, "and it's a masterpiece." "Picturesque and Sublime: Thomas Cole's Trans-Atlantic Inheritance" will appear May 1 to November 4 at the Thomas Cole National Historic Site in Catskill. (518) 943-7465.